The book itself is a 1948 edition, and the article-as-bookmark was about a third of the way into the book, part way through Life with Father, Day’s best known work and the one that earned his keep and became a Broadway show. 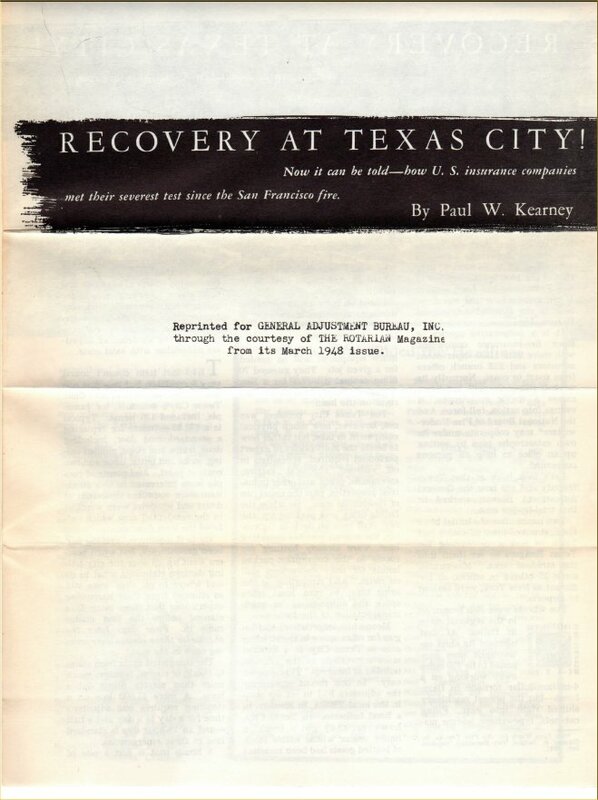 The article details how the General Adjustment Bureau handled claims swiftly after the Texas City Disaster and how it overcame challenges in logistics, staffing up its office–a converted liquor store–in Texas City, and how it housed people as well as how it conducted its insurance adjustment business. General Adjustment Bureau was not an insurance agency; instead, it was an organization commissioned by insurance agencies that did not want to spend on claims adjusters of their own. Instead, they hired General Adjustment Bureau to do that field work and paid for the service out of premiums. General Adjustment Bureau is still in business, although through the divisions parted out of the GAB Robins company in the end of 2010 and beginning of 2011. The article originally appeared in The Rotarian, the magazine of the Rotary club. See what you can learn from these abandoned bookmarks? Given that the book itself bears the stamp of a Kansas City used bookstore within it, I can assume that the ticket stub came from a Kansas City fan and not an Orioles fan. On May 10, 2003, the Royals were in first place in the American League Central, not that I would have known then. I lived in the St. Louis area, and if you’re in the St. Louis area and think about Kansas City+baseball, you think one of two things, depending upon where you were in 1985. You think They have baseball in Kansas City? or you think Effin Don Denkinger! Lest you wonder where I stand, let me tell you I alone in Busch Stadium (II) booed Don Denkinger when he called a game in 2000. The Royals beat the Orioles, 8-4, that night. The manager was Tony Peña, a former Cardinal catcher. The center fielder that night was Carlos Beltran, a player who would worry Cardinals fans in the coming years when he played for the Astros and Mets. You see, if you’re a Cardinals fan, it becomes all about the Cardinals. Section 408 lies on the third base side; I assume row U is the top of the nosebleeds such as they are. 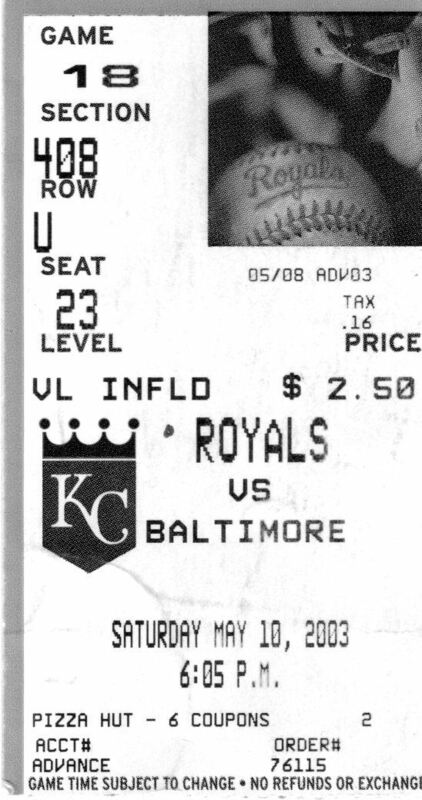 Note the price of the ticket, even in 2003: $2.50. Tickets to Milwaukee County Stadium were higher than that in the 1980s. The ticket lie closed in that book for over eight years before I bought that book (in June) and read it (in August).